Verb. Pr. St. Benetar is a 2009 Black/bay Hanoverian mare standing at 16.2h . 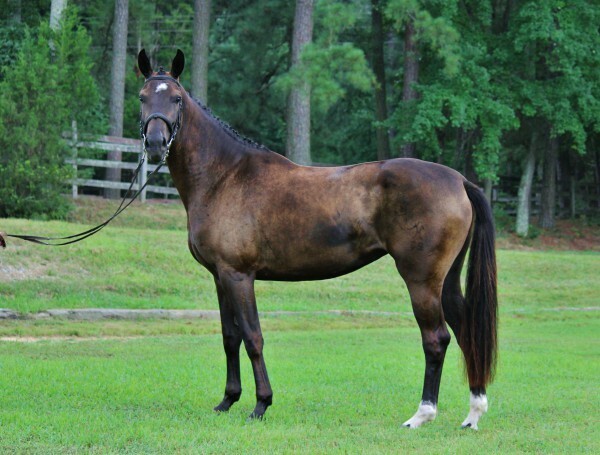 She is registered Hanoverian who attained Premium mare status at her RPSI Mare Inspection at Sankt Georg Farm Int’l in 2012, as a just turning 3 year old! She herself is an amazing mover boasting elite international dressage lineage and numerous FEI superstars on both sides. She herself provides beautiful and harmonious conformation coupled with great elastic movement, showing exceptional swing and reach. V. Pr. 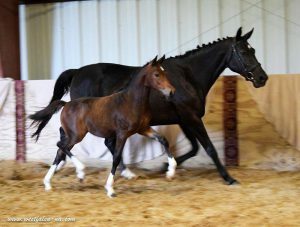 St. Benetar’s sire, Hanoverian stallion Black Tie, is by the renown Baroncelli who contributes the popular Bolero bloodlines that have produced so many top FEI dressage horses like Beauvalais, Brentina, and Bonaparte. Her mother, Daniela, was bred by and imported to the USA from Hengstation Pape in Germany (one of Germany’s best breeding stations). 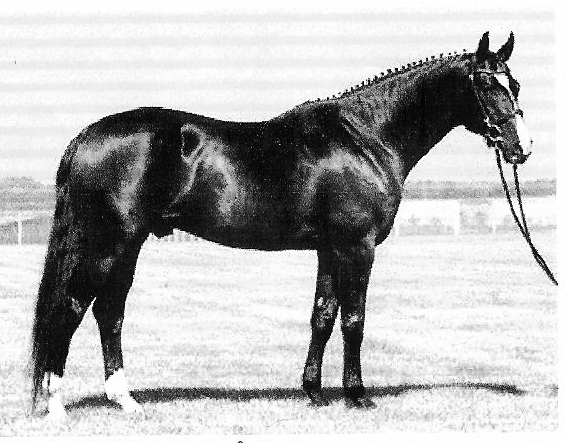 She was the daughter of their flagship stallion Davignon; one of Donnerhall’s best sons, who competed through Grand Prix in dressage and exemplifies the brilliant Donnerhall x Pik Bube nick that is present in the pedigree of so many top FEI dressage horses. So, in Daniella, we must cherish the amazing combination of the legendary dressage powerhouse lines of Davignon/Donnerhall (Stallion of the Century) and the highly influential G lines of Hanoverian breeding. Those G lines, which are contributed through her dam’s sire by Garibaldi II/Grande, are prized for consistently producing FEI stars who are as famous for their great minds and rideability, as they are for their physical aptitude for the sport of dressage. Horses like Gifted, Grundstein, Gigalo, Graf George, and Goldstern epitomize the coveted G lineage! 2017 German Riding Pony filly- Premiere, sired by Evans Providence of the Night. Westfalen Site Champion and Premium foal who is a top class scoring an 8.8 for her flowing uphill movement and 8.3 on conformation and type! 2016 filly- Fashionne, was sired by Furst Fohlenhof, the highly successful German stallion who was Bundeschampion in 2013 and Reserve Champion in 2014. This filly is simply exceptional in every way. Large framed, elastic and expressive movement, correct conformation and topline and super good looks as well! She is in the color of Fidertanz, himself, and with lots of chrome to highlight her many assets. Fashionne impressed! scored a 9 on movement at the RPSI Inspection and was Gold Premium and Site Champion foal as well. 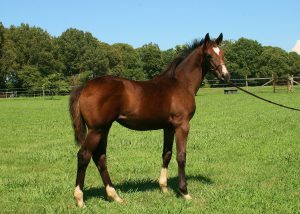 This is the first USA born foal by Furst Fohlenhof and was proclaimed a huge success! 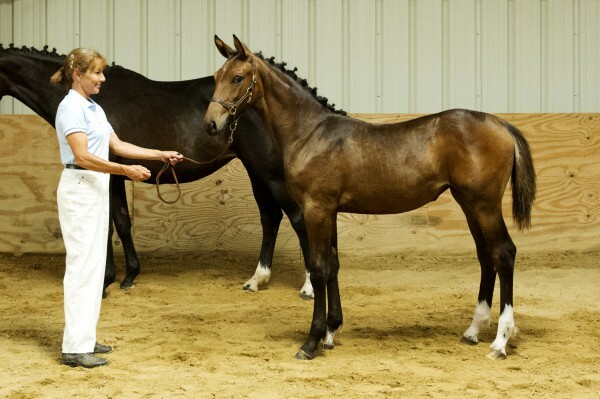 RESERVE CHAMPION 2016 FOAL! and 2016 RPSI SSA FUTURITY WINNER 2016! In 2015, Druscilla was born and thus the request for a filly by Dream Along was fulfilled! Druscilla- (Verb Pr St Benetar by Dream Along) is a large framed, lofty mover who pleasantly combines the Dream of Love/Corleone lines with the Donnerhall/ Garibaldi lines which we are happily retaining for our breeding program! 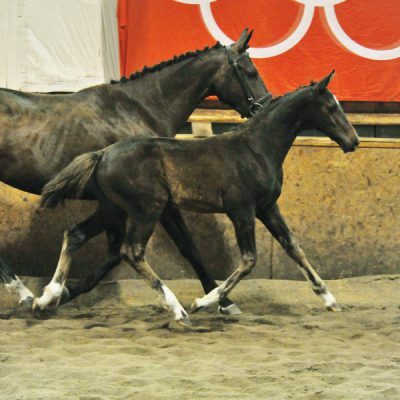 Davinci at RPSI Inspection 2013.First foal of Benetar, Davinci, was sired by the Oldenburg stallion, Dream Along. He scored an 8.6 for movement at his RPSI Inspection, was awarded Gold Premium foal status, and was 5th overall for colts of 2013! DaVinci was purchased by “remaining anonymous” Canadian and we are expecting to see him on the International scene in a few years.